These Fly and Dine packages are made for two or more and are sure to leave a lasting impression. Take a look at the air tours below to see which is best suited to your tastes and preferences, and call us to reserve your charter flight today. Are you looking for a truly romantic way to spend the afternoon or evening with someone special? Searching for a unique gift to give a friend or family member? Or looking for a way to reward an employee or business associate? Lake Country Airways offers scenic flights over unspoiled Ontario wilderness to a variety of interesting and unique dining destinations. You can also dine right here on our base of operations at Tailwinds Bar & Grill. Enjoy a great meal while watching float planes take off and land in the bay from our patio, only steps away from the water’s edge. Be sure to check out the spectacular sightseeing options we offer and take an exciting scenic trip before or after your meal to put a cap on an amazing day. Explore the great outdoors from a whole new perspective as we fly north past the Lake of Bays and Huntsville, taking you to one of Muskoka’s premier resorts. Located on Peninsula Lake, Deerhurst Resort is a year-round retreat in Ontario’s famous cottage country – one of National Geographic Traveler Magazine’s “Best of the World 2012” recommended places to visit. With a choice of two upscale restaurants and two casual dining experiences, there are options to suit every taste. You will enjoy sweeping lake vistas and summer patio dining while eating locally sourced ingredients including honey, herbs, shiitake mushrooms and maple syrup harvested right at the resort. 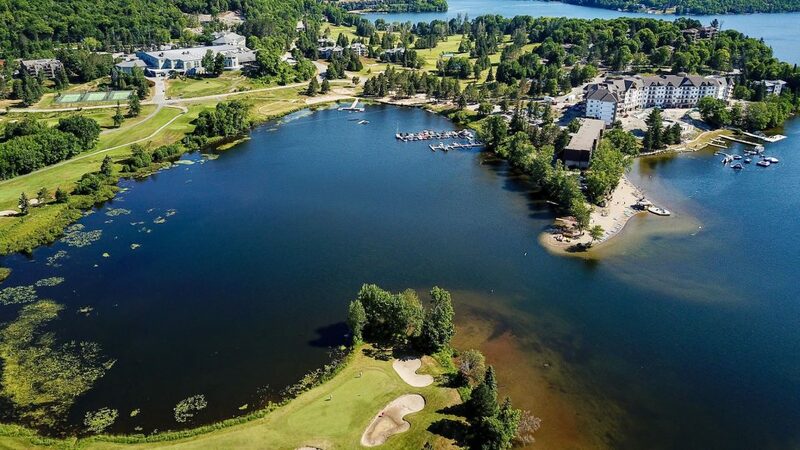 Enjoy a relaxing stroll along the water and see why Deerhurst Resort has been such a popular Muskoka retreat for over a century before the scenic flight back to Orillia. For a scenic view of the rugged, inaccessible Canadian wilderness, allow us to guide you through the remote regions of the Haliburton Highlands by air. On this scenic tour, you will view large expanses of inaccessible provincial parkland and wildlife reserves – rolling, mountainous terrain and wild country dotted with lakes and winding streams best appreciated by air. While there is a cornucopia of exquisite dining options in the Haliburton Highlands, we recommend either Zachary’s or Trading Bay restaurants for their exquisite waterfront dining in the picturesque village of Dorset. Located on the Lake of Bays, these restaurants offer tasty Canadian cuisine in comfortable and enjoyable atmospheres with great hospitality. Eat indoors or out on the beautiful patios. Our Haliburton Highlands tour is a popular package during early autumn when fall foliage is at its peak, although the tour and restaurants are certain to be enjoyed at any time of year. For an unforgettable scenic tour and unique dining experience, fly with us from Orillia over the stunning 30,000 Islands on Georgian Bay where we’ll land at Sans Souci Peninsula, also known as Frying Pan Island. 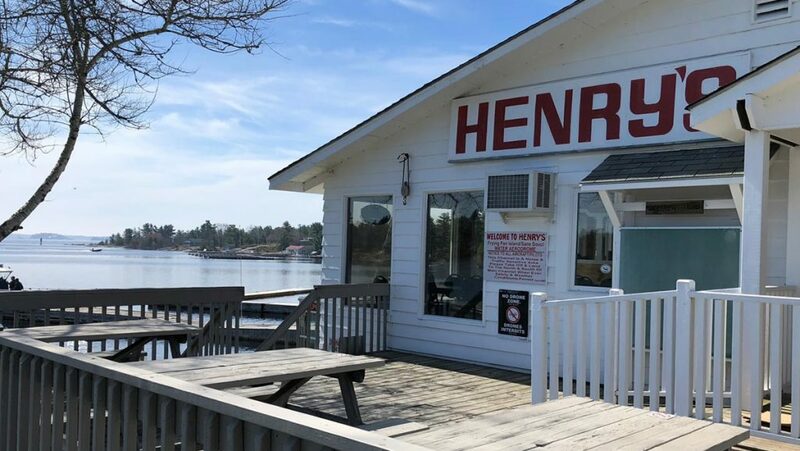 There, we’ll introduce you to Henry’s Fish Restaurant, the world-famous fish and chips hideaway that can only be visited by boat or plane. Enhanced by the traditional cottage flair of the original, the interior of Henry’s South boasts a post-and-beam structure, with lanterns strung up by thick rope, as well as fishing nets and big catches stuffed and mounted on the walls. After a relaxed meal on the water, we’ll begin our return flight to Orillia. This time, we’ll fly south toward the Trent Severn Waterway, over the Marine railway and the Swift Rapid lift lock. From there, we’ll travel along Sparrow Lake and eventually make our way back to Orillia. For an enjoyable afternoon or evening getaway with a nod to our local heritage, fly with us from Orillia over the Muskoka Lakes to Gravenhurst where we’ll land at the historic Muskoka Wharf. 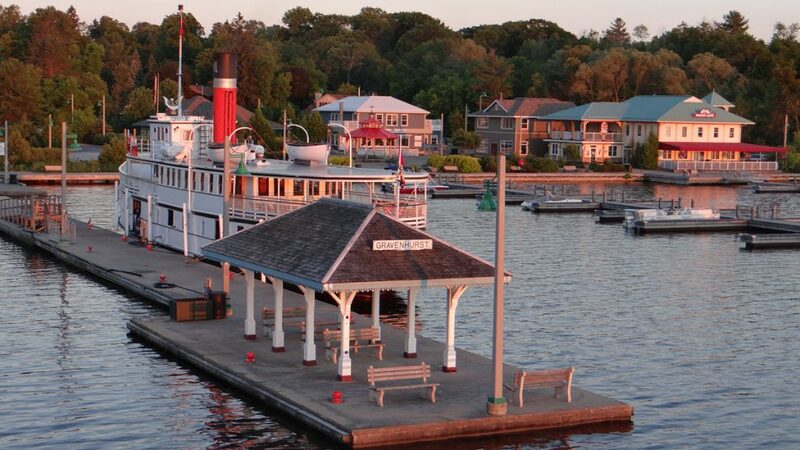 There, you can stroll along the picturesque boardwalk to tour local shops and the famous Muskoka Steamships docked in the harbour. When you’re ready to dine, there are a number of restaurants to choose from. We recommend The Gravenhurst Boston Pizza, perfectly located right here on the wharf. The menu offers a range of exquisite dishes boasting local ingredients, combined with gracious hospitality for that true taste of Muskoka. After your meal, we’ll return to Orillia via the Trent Severn Waterway, offering you an aerial view of the fascinating Lock 42. Are you ready to have a dining experience unlike any other? Take date night to new heights by requesting a Fly and Dine package for that special someone today! Pick a package below, let’s eat!